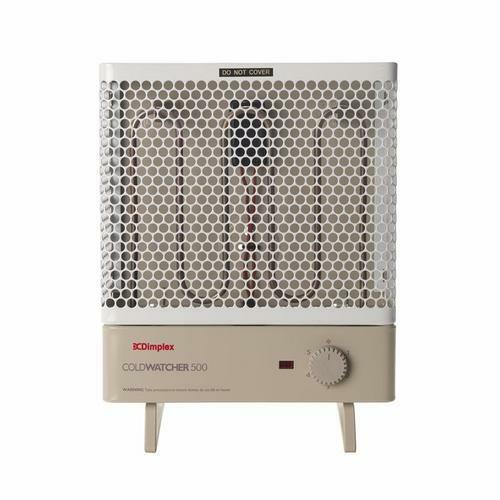 The Dimplex Coldwatcher multi-purpose heater model MPH500 has an output of 500 watts. Controlled by a variable thermostat with a minimum setting suitable for frost protection, they are specially designed for situations where localized heating is needed, or where a small heater is only necessary for general heating or frost protection. The coldwatchers are versatile and robust units ideal for greenhouses, lofts, garages, utility rooms, sheds, chalets. spare rooms, conservatories, airing cupboards, outside WCs, kiosks, yachts, checkouts, etc. Letting pipes, household fittings and furnishings and equipment succumb to frost can cause expensive damage to the fabric of your home or office. From Dimplex, the experts in frost protection heating, the Cold Watcher has thermostatic control with frost protection and a hefty 500W output. It can be freestanding or wall mounted and is safe to use in wet areas (IPX4). The Cold Watcher will operate with minimal input - simply switching itself on-and-off to maintain a protective heat in cold areas of your home or office. This heater is also wall-mountable (brackets included) making it ideal for applications where a portable heater is not required, particularly in commercial situations such as temporary offices and site accommodation. Controls: Thermostat: Variable, bi-metallic with frost protection at lowest setting. Neon mains indicator. Element: Mineral Filled type. Safety Cut-out Supply interrupt type. This item comes complete with a 12 month warranty from the manufacture. Do you take off vat for delivery to jersey?